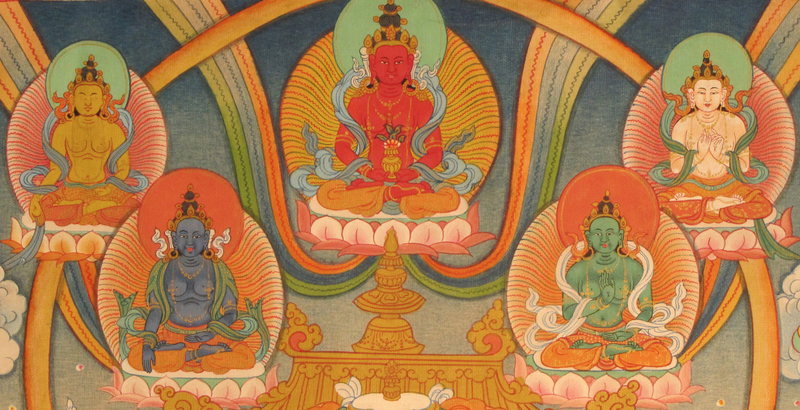 On August 1, 2015 at Padma Samye Ling during the Dzogchen Summer Retreat on Lama Shabkar’s “Golden Needle,” a student asked for an explanation of the “five wisdoms” in Tibetan Buddhism, and how they are related to the “five poisons” of ignorance, attachment, anger, jealousy, and pride. The five wisdoms (Tib. ཡེ་ཤེས་ལྔ་, yeshe nga; Wyl. ye shes lnga) are five aspects of primordial wisdom (Tib. ཡེ་ཤེས་, yeshe). Watch Khenpo Rinpoche’s beautiful answer to this very important question on how to bring out clarity in one’s meditation. Photo of the Five Dhyani Buddhas from the Vajrakilaya Medicine Buddha Temple at Padma Samye Ling.